The acute phase of chikungunya infection typically lasts from a few days to a couple of weeks. Characteristics of the acute phase include an abrupt onset of chills, fever reaching up to 40 °C (104 °F), vomiting, nausea, head ache, arthralgia (joint pain), and in some cases, maculopapular rash characterized by raised, spotted lesions. Severe joint and muscular pain is the main and the most problematic symptom of chikungunya. The pain is so intense that makes movement very difficult and prostrates its victims. Typically, the fever lasts for two days and then ends abruptly. However, other symptoms like joint pain, intense headache, insomnia and an extreme degree of prostration, can last for about 5 to 7 days. During the acute phase, the viral load can reach 10E8 viral particles per ml of blood. The virus has been shown to infect epithelial and endothelial cells, primary fibroblasts and monocyte-derived macrophages, explaining the involvement of muscles, joints, and skin connective tissues. The chronic stage of chikungunya is characterized by poly-arthralgia that can last from weeks to years beyond the acute stage. Patients suffer from joint pains for up to 2 years, depending on their age. Ninety-five percent of infected adults are symptomatic after infection, and of these, most become disabled for weeks to months as a result of decreased dexterity, loss of mobility, and delayed reaction. Recurrent joint pain is experienced by 30–40% of those infected. During early epidemics, rare but serious complications of the disease were noted, including myocarditis (inflammation of heart muscle), meningoencephalitis (inflammation of the brain and meninges), and mild haemorrhage. Other complications, such as uveitis and retinitis (inflammation of the eye), have been described. Death caused by chikungunya infections appears to be rare. However, increases in crude death rates have been reported during the 2004–2008 epidemics. More than half of patients who suffer from severe chikungunya fever are over 65 years old, and more than 33% of them die. Most of these adults have underlying medical conditions and appear to be more likely to suffer complications. Children are also disproportionately affected by severe chikungunya fever. During recent outbreaks, it was observed that most chikungunya infections occurring during pregnancy do not appear to result in transmission of the virus to the fetus. However, if the pregnant woman is viremic at the time of delivery, there is a risk for mother-to-child transmission with a vertical-transmission rate of almost fifty percent. Currently, there is no evidence that the virus is transmitted through breast milk. Often symptoms in infected individuals are mild and most patients recover fully. Infection appears to confer life long immunity. Chikungunya virus infections are sometimes confused with dengue viral infection, because both diseases can present with high temperatures and myalgias (muscle pain) in people living in or returning from tropical areas (see figure 2, and also diagnosis of Dengue and Chikungunya). Although these diseases share similar clinical features, prominent and prolonged joint pains are more consistent with chikungunya, whereas haemorrhage is more common in cases of dengue virus infection. 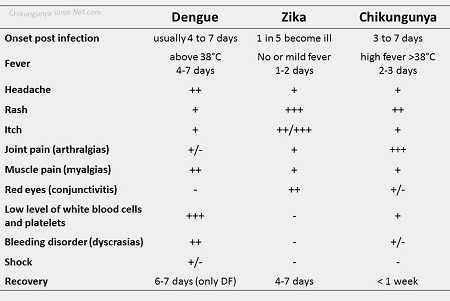 Figure 2: Comparisment of Dengue, Zika and Chikungunya symptoms. You can also download the original image in high resolution as jpg, tiff or powerpoint file.